Receipt of benefits from other traditional transfer programs by Supplemental Nutrition Assistance Program (SNAP) families is common, with 76 percent of those families receiving at least one other major benefit of that type, excluding Medicaid, in 2008. However, over half of these only received one other benefit and only a very small fraction received more than two others. 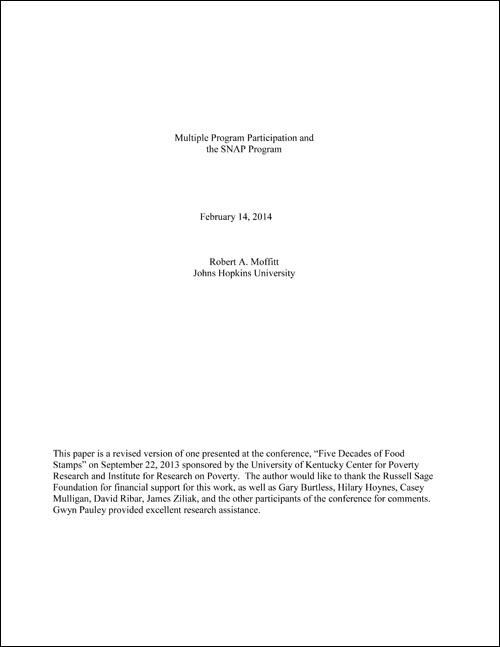 Over the long-term, multiple benefit receipt among SNAP families has been falling, a result of declines in the Temporary Assistance for Needy Families (TANF) caseload offsetting rises in the Supplemental Security Income (SSI), Social Security Disability Insurance (SSDI), and Special Supplemental Nutrition Program for Women, Infants, and Children (WIC) caseloads. Finally, this analysis shows that high marginal tax rates generated by multiple program receipt are relevant for only a small portion of the TANF caseload, namely, the portion of the caseload that is nondisabled, nonelderly, and have earnings in the phaseout regions of the programs where marginal tax rates are high. The vast majority of SNAP families are not affected and, indeed, most have sufficiently low earnings that they face negative cumulative marginal tax rates.